Please be advised: Players from United Kingdom are not accepted at CryptoWild Casino. Try one of the three casinos below, as they welcome UK players with great bonus offers! Want more options? Take a look at our list of reputable Australian online casinos for an AU-friendly choice. CryptoWild Casino is an instant play, mobile, and live dealer casino with full support for major crypto-currencies like Bitcoin and Ethereum. CryptoWild Casino has a very "animated" and energetic website design. They have taken a lot of inspiration from popular animation icons like Smurfs and Angry Birds. Colorful characters are all around the website, projecting a naughty and fun image. The casino combines vibrant colors with a subtle white background to good effect. The end result is an online viewing experience that is easy on the eyes. The menus are easy to spot and navigate, and the text easy to read. There are three language options - English, Russian, German. Launched in 2017, the Curacao-licensed casino serves a rather niche audience among online casino gamers – crypto-currency enthusiasts. Yes, CryptoWild casino does not support regular bank or online card transactions. Instead, they only support crypto-currency. That might seem like a major turn off for folks who are not invested in crypto-currencies in any way. But for regular Bitcoin users who love casino gaming, CryptoWild is like manna from heaven. The fundamentals of this casino are excellent. It offers a wide selection of quality games, has a focus on responsible gambling, an exciting array of bonuses, promotions and tournaments, and last but not least, a responsive customer support team. Online Instant Play Casino: The casino keeps things as straight-laced as possible. It is designed as a web-only service that players have to access using an internet browser. They can create an account, deposit bitcoins, and wager on the latest casino games, all within the browser. As long as they remember their account name and password, players can also access the casino from as many devices as they like. Instant play casinos are perfect for the modern world, where everyone has at least two or three devices including PCs, tablets, and mobile phones. Downloading special client software for each device would be impossible. This is why modern casinos like CryptoWild opt to go the instant play route. 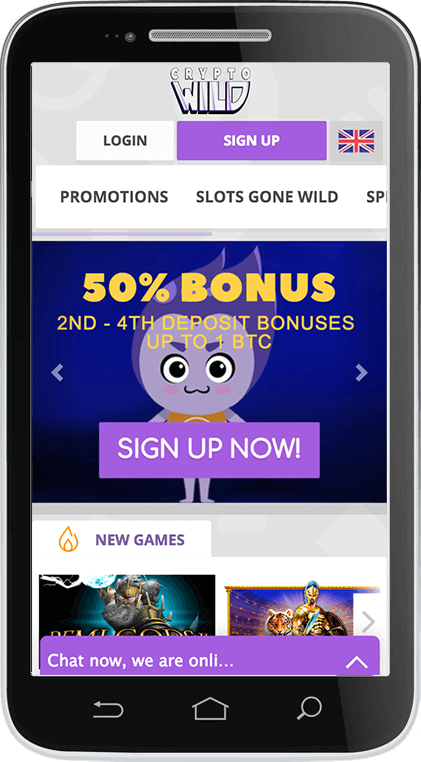 Mobile Casino: CryptoWild has been optimized to load perfectly on the smaller mobile screens. All the buttons and links are easily accessible using fingertips and the entire casino looks just as good, if not better than on a PC or laptop screen. There is no provision for a separate mobile gaming experience at this casino. The overall experience is the same whether a player uses a PC or mobile device to log in and play his/her favorite games. All games are available across multiple hardware and software platforms. Players can use Windows, Apple, and Android devices to play casino games at CryptoWild mobile casino with zero compatibility issues. The casino is a multiplatform casino, and has partnered with 11 different software providers, including top providers that serve the Australian market. Contains numerous titles from all the providers, including favorites like ChilliPop, Lava Loca, Aztec Magic, Fortune Dogs, Jungle Treasure, and 8 Lucky Charms. Caribbean Hold ‘Em, Baccarat, Blackjack, Dragon Tiger, and Hi-Lo are some of the popular card games available here. Includes BetSoft Gaming titles like A Night In Paris, Faerie Spells, Charms & Clovers, and At The Copa. Australia players can find roulette games from providers like Belatra and BetSoft Gaming at CryptoWild Casino. Many classic Habanero video poker titles are here, along with games from BetSoft gaming. CryptoWild also has a section for more unusual casino games like Keno, and scratch cards. The live game rooms at CryptoWild Casino are powered by eZugi, a leading live dealer software provider from the US. Two common categories, “New” and “Popular”, allow players to sort games based on their release date and among other players at the casino. CryptoWild Casino is an HTML5-based platform that runs smoothly on Edge, Firefox, Chrome, and Safari browsers. Since virtually all modern mobiles/tablets have at least one of these browsers on board, it stands to reason that most mobile devices can run the casino well. Choose a game and start playing for real cash! Using this method, players can access all games available at the casino, both on their mobiles as well as PCs. It will only take a minute to register, login, claim your bonus and start playing in AUD. Wildspins Bonus: Players who make at least one deposit per month are eligible for weekly free spins. For regular players, the number of free spins awarded is 20. This can rise all the way to 50 for VIP players. TGIF Reload Bonus: Players can claim as much as 1BTC, 10ETH/BCH, 50LTC, or 2000 DOGE as part of this bonus every Friday. The casino offers a 50% reload bonus on the first deposit made on a Friday. The wagering requirement is 50x and slots games provide maximum value for this bonus. Wild Cashback Bonus: This bonus offer is available on Sundays. Players who have had a minimum deposit, wager, and loss of 0.001 BTC, 0.01 BCH/ETH, 0.05 LTC, or 1,500 DOGE on the previous day are eligible for this bonus. They claim a maximum of 0.10BTC, 1 BCH/ETH, 5 LTC, or 200,000 DOGE as cashback. Limited Tournaments & Leader-boards: The casino also holds exciting tournaments and leader-boards each month. Players who manage to reach the top of these leader-boards can claim exciting prizes like hundreds of free spins on slots and cash prizes in Bitcoin. Besides the cashback offer, CryptoWild casino also provides a whole range of other bonuses to its VIP members. For instance, on promotional offers involving free spins, VIP members can get double as many free spins as regular players. At CryptoWild Casino, Australian players no longer have to fret about converting AUDs into other currencies. This casino has done away with traditional banking and payment methods altogether. At CryptoWild, players enter the brave new world of crypto-currencies! All deposits are made in crypto-currencies like Bitcoin and Litecoin, and the casino also processes withdrawals using Bitcoin. Australian players who have Bitcoin wallets can now enjoy privileges that players who use bank accounts cannot even dream of - free and instant deposits and withdrawals! There are no major charges or fees in place at the casino regarding payments. Minimum deposit limits are in place for each currency though. For Bitcoin, the deposit limit is 0.0001BTC, while for DogeCoin, it is 1000 DOGE. Withdrawals are made primarily through Bitcoin at the casino. The minimum a player can withdraw is 0.0001BTC, and the maximum is 0.5BTC per week or 2BTC per month. VIP players can get higher withdrawal limits. Progressive jackpot winnings are not subject to these limits. Unlike casinos that depend on traditional banks, CryptoWild casino does not delay withdrawals by days and weeks. All transactions are processed instantly. With withdrawals, there is a slight delay for security reasons, as the casino needs to ensure that a player himself is making the request. Contact Form available at Website: 24 hour response time. Email at support@cryptowild.com: 24 hour response time. Live Chat available 24x7 at Website: instant response. CryptoWild is a casino that manages to get the basics right and then provides something extra in the form of amazing bonuses and a pure crypto-currency experience. For Australian players holding crypto-currencies, this casino is a no-brainer. And if you are an Australian casino gamer who does not have any crypto-wallet, the amazing gaming experience at this casino might just convince you to get invested in Bitcoin or other alt-coins in 2019. They do score well in terms of pokie selection, bonuses, promos and customer support. Check them out if you have a penchant for Bitcoin wallets.